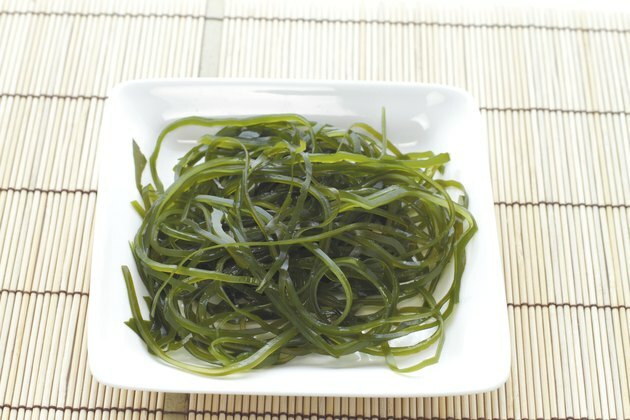 You may know that vegetables are good for you, but you may not know that sea vegetables should also be included in a healthy diet. Kelp and seaweed are loaded with nutrients and are a source of essential vitamins. Kelp is a type of seaweed found in ocean waters all over the world. Seaweed is available in many varieties, including wakame and kombu, which are popular in Japanese cuisine, and dulse, which can be found on the coasts of Ireland and the state of Maine. 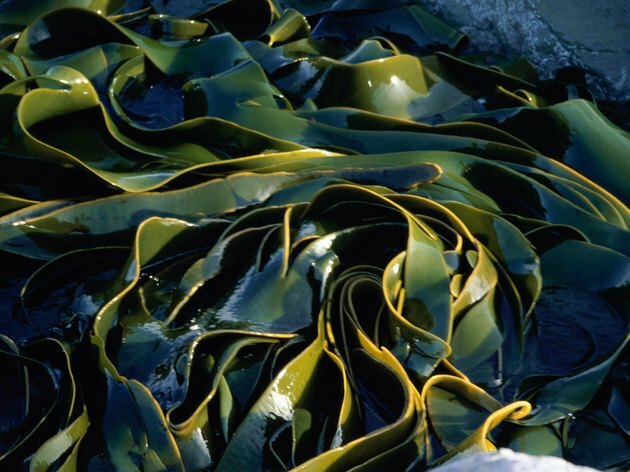 Seaweed is an excellent source of minerals, but people with thyroid problems should seek medical advice before consuming kelp, which is high in iodine. 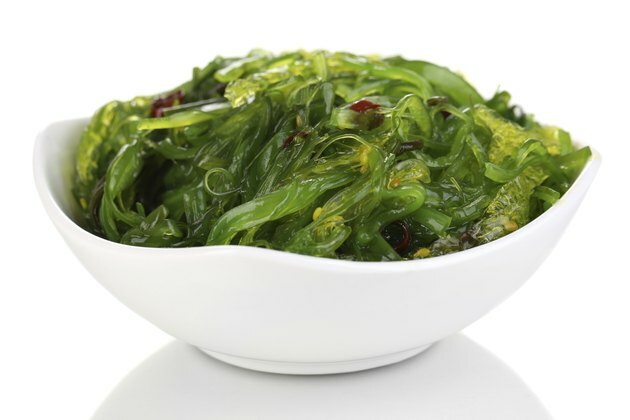 According to the European Food Information Council, seaweed is one of the few vegetables that contain vitamin B-12, which is important for a healthy nervous system. Wakame seaweed is a good source of vitamin A. Kelp and other types of seaweed contain measurable amounts of vitamins C, E and K, as well as niacin, folate and choline. In fact, just an ounce of seaweed can provide you with nearly 14 percent of your recommended daily allowance of folate, and one ounce of kelp provides 23 percent of your daily vitamin K needs. Seaweed is high in minerals absorbed from seawater. One third of a cup of dulse contains 19 percent of the iron you need daily and wakame can provide 20 percent of your daily manganese needs. Dulse is also a source of potassium, and all seaweeds provide magnesium, iron and zinc among other minerals. Kelp is a good source of calcium, offering 17 percent of daily needs in one cup. Be cautious with the amount of seaweed you add to your diet, as it has sometimes been found to contain heavy metals. Adequate amounts of iodine are essential for a healthy thyroid and during pregnancy. Iodine deficiency can lead to hypothyroidism and cause goiters. The only sources of iodine are dietary, and seaweed is a good source because seawater contains iodine. Information from the American Thyroid Association concludes that the cure for iodine deficiency and prevention of deficiency both come from ingesting adequate amounts of iodine. Just one-eighth of a cup of kelp provides all the iodine you need in a day, but you should also be aware that iodine needs should be balanced and excessive iodine can be dangerous and lead to hyperthyroidism. Only 150 micrograms per day is recommended by the Institute of Medicine. If you have thyroid problems, it's best to check with your doctor before adding more iodine to your diet. Omega-3 fatty acids are crucial to brain development and can help prevent heart disease. One of the omega-3 fatty acids is DHA, which is vital to nervous system development and vision in infants. 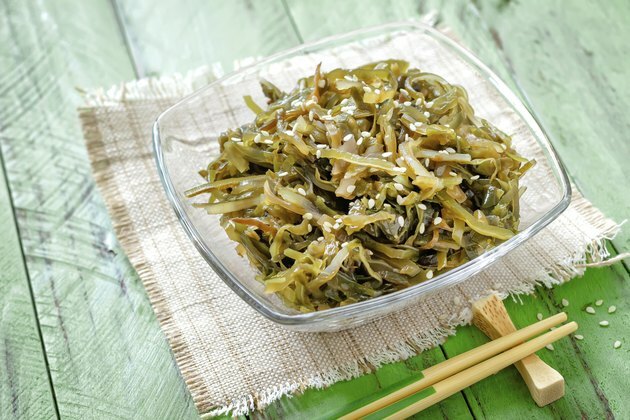 According to the University of Maryland Medical Center, seaweed is a good source of DHA for vegetarians. In a study published in the September 2009 issue of "The Faseb Journal," researchers found that 200 milligrams of DHA daily can help prevent heart disease in men. One ounce of wakame seaweed contains a little over 52 milligrams of omega-3 fatty acids. In 2005, scientists at the University of California, Berkeley, found that when kelp is included in the diet, levels of estradiol decreased. Elevated levels of estradiol have been linked to the formation of breast cancer, and the researchers found that dietary kelp lowers estradiol levels. 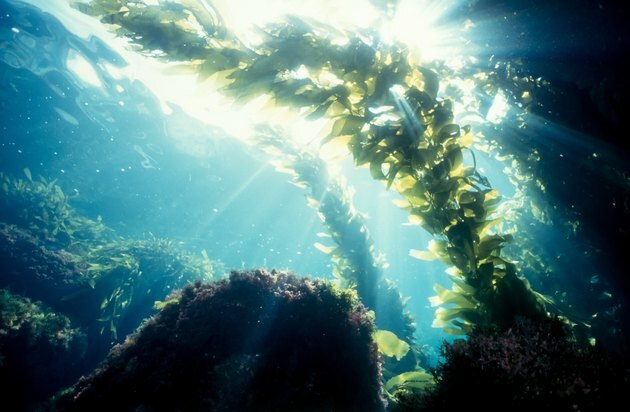 They concluded that including kelp in a healthy diet may lower the risk of breast cancer, but caution that more research is needed. Is Dried Seaweed Good for You?